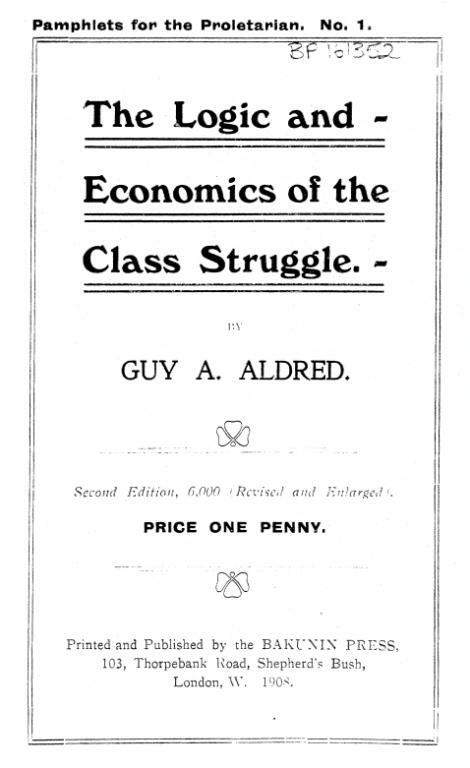 In 1907 Guy Aldred, in conjunction with John Turner and others, formed the "Industrial Union of Direct Action". A union opposed to reforms its purpose was to organise for social revolution. In a short period there were branches in Dover, Liverpool, Leeds and Weston-super-Mare, plus six branches in London. Shortly after this Guy founded the "Communist Propaganda Group". The group spread rapidly, first with several branches in London, Wales, the North of England, then to Scotland with branches in Glasgow, Paisley, Fife, Aberdeen, Dundee and several towns in Lanarkshire. In 1921 all these groups federated into the "Anti-Parliamentary Communist Federation". It was also around 1907 Guy, in the basement of his home, set up the first of his "Bakunin Press". Bakunin Press published many pamphlets, including a series called 'Pamphlets for the Proletarian', of which this PDF was the first. Also included was "The possibility and philosophy of anarchist Communism" (1907) and 'Militarism and Revolution' (1909).